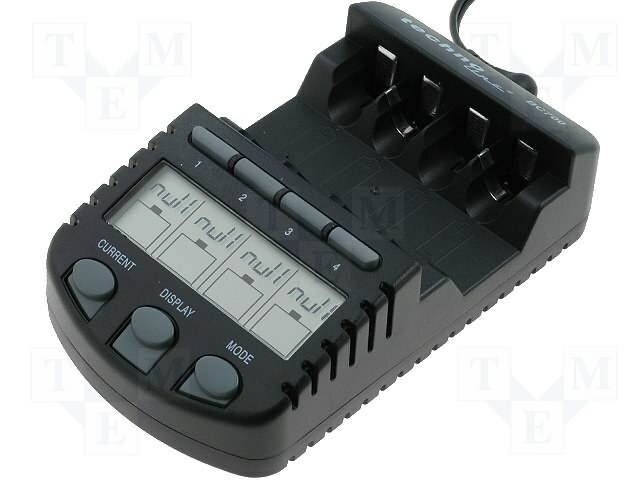 TME’s range of products includes professional BC-700 microprocessor chargers with autonomous charging control for each channel. The charger allows charging of cells made in the NiMH and NiCd technology with the AAA and AA battery size. and temperature sensor (charging is stopped if the cell temperature exceeds 53 ̊C). Charger enables cells discharging with: 100mA, 200mA, 350mA currents. After discharging, the charger automatically turns into cells charging with the current twice as high as the one with which they were discharged. In case of cells unused for a long time or while formatting new ones, the charger repeats discharging and charging until cells reach their maximum capacity.